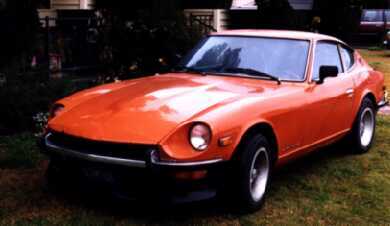 The Datsun 240Z sport cars below were junkers some years ago. 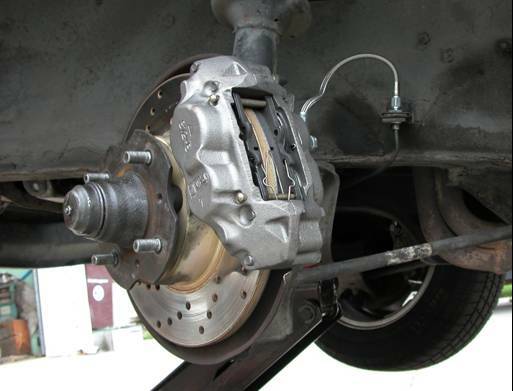 These cars are notorious for rust damage to the wheel wells and floor pans. I have purchased several 240Zs at a discount because they don't run. Later, I found they did not run because the previous owner did not know how to adjust the double SU carburetion system. This 1973 240Z is my comfortable car. It has an automatic 3-speed transmission, air conditioning, 4 speaker stereo system, and a suspension with adjustable shocks. It was a junker that had to be towed home when I bought it. Still, I paid a good price because the body was pretty straight and the interior good. Hours after I got it home, I realized it wasn't running because the fuel line was clogged with rust from the gas tank and the carburetors were way out of adjustment. In September of 2001, the head gasket blew releasing coolant water into cylinder number 3. The one common problem with the near bullet proof L24 engine is cracking of the aluminum head; generally from the thermal shock of water in an overheated engine. I replaced the cracked head with a 1972 head from my green parts car. I didn't know it at the time but the '72 head has a smaller combustion chamber and a higher compression ratio than the original '73 head. In 1973, EPA regulations required reduced compression to minimize nitrogen oxides that cause smog. This also decreased efficiency and power. 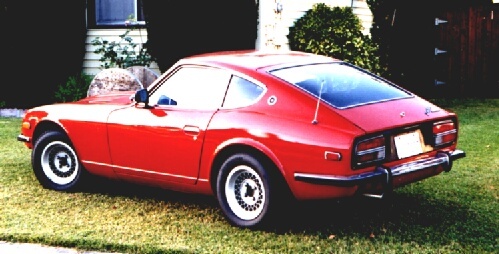 With the '72 E88 head this Z had to be run on premium gasoline to avoid knocking. While I had the head off, I decided to replace the stock exhaust system with a header and 2 1/4 inch diameter exhaust pipes. Proper fit of the new exhaust system took a lot of fine adjustment. The Monza header required extensive grinding of the seal flange to clear the thermostat housing and intake manifold plus grinding to match the ports. Building an exhaust pipe that did not rattle on the floor pans or scrape on speed bumps meant cutting and welding a dozen subtle curves to fit the contours of the underbody (next time I will have a professional do it for about the same cost). This change made my "comfort car" louder but it sounds good and has more high rev power. Ultimately, I rebuilt this engine. Installing |Air-Conditioning| in this car was complicated. Air conditioners work by pressurizing Freon gas to remove latent heat in a cooling heat exchanger (condenser) as the gas turns into liquid. 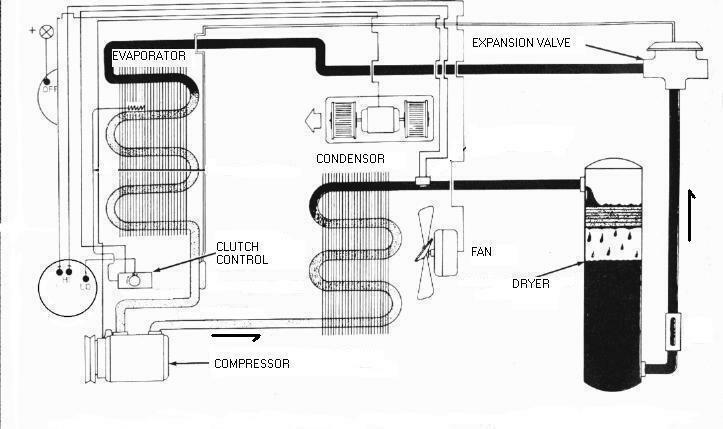 The liquid Freon is sent to the interior of the car where it cools air as it takes on heat and evaporates in another heat exchanger (the evaporator). 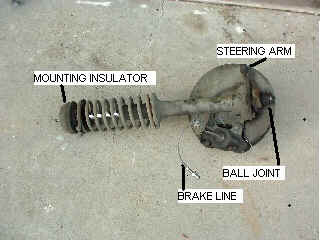 I had an after market Borg-Warner AC system in my green wreck. First, I had to remove the old Freon-12 without releasing it into the environment. A Freon pump from an old refrigerator was used to pump the Freon from the AC system to an empty propane bottle sitting in ice water. The evacuated AC system was disassembled into components - pump, drier, evaporator, condenser. The evaporator housing was sealed with foam and silicone caulking to the heater blower inside the car. Holes were cut in the fire wall for Freon supply and return lines to and from the evaporator in the passenger compartment. The condenser was installed in front of the radiator. 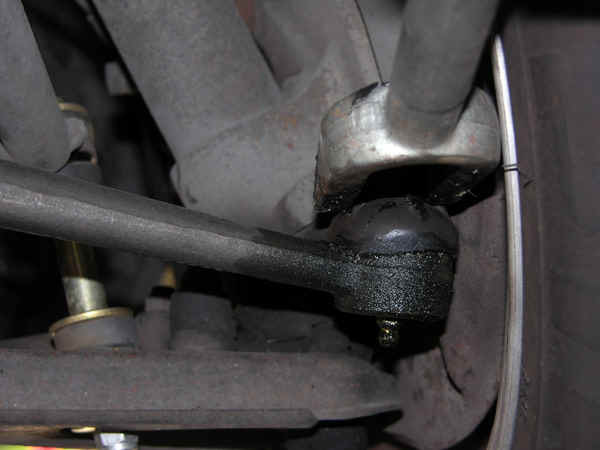 The pump was mounted with a bracket to the engine block for V-belt power from the crank shaft pulley. All the Freon hoses were connected with double clamps. A new drier was installed in the high pressure Freon line between the pump and evaporator. The system was evacuated with a vacuum pump and closed up. The next day, the system vacuum reading was unchanged so I knew the system had no leaks. With the engine at a high idle, I charged the system with fresh Freon-12 through the low pressure side of the AC pump. Liquid Freon appeared in the drier sight glass. Cool air began flowing from the passenger compartment air vents. Oooo, my summer car. This 1972 Datsun 240Z has been kept almost completely stock. There was severe rust in front of the rear wheel wells, children had played on the roof, the engine would hardly run and the left rear suspension control arm was bent from some impact. The interior was in pretty good shape and, it turned out, the engine was in good shape too. The rust was cut out with an air chisel and grinder, then new sheet metal was MIG welded into place. The body dents were mostly pounded out from behind. Doors were rehung and locks rebuilt. I painted this car in my patio with stock color enamel plus clear coat. The car was detailed with the best parts off my other cars. The rear suspension control arm was replaced with one from my wrecked (not my fault) green '72 240Z. 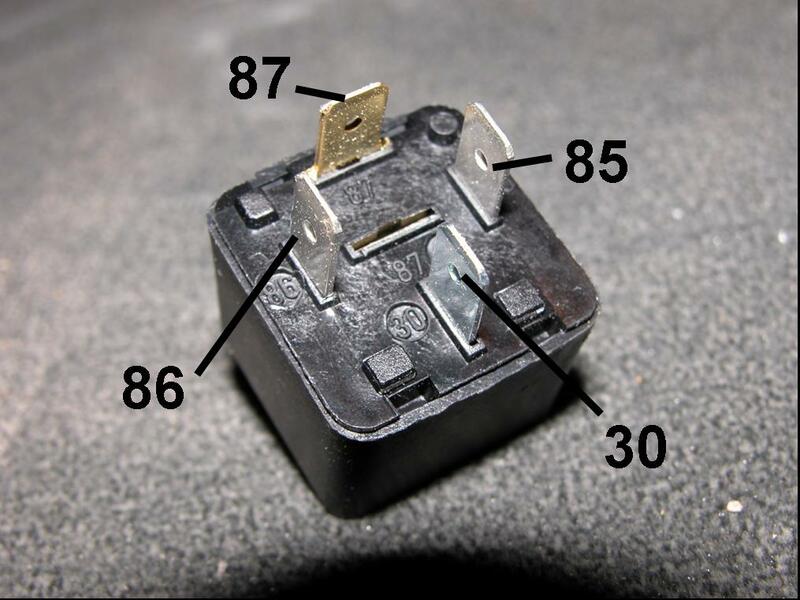 Some parts, like door light switches and bumper rubber, were purchased from after market parts suppliers. The engine had consistent high compression across all 6 cylinders. I adjusted the valves, set ignition timing and balanced the carburetors. 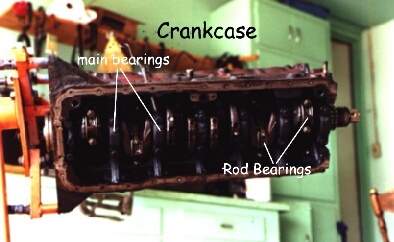 Datsun 240Zs have two horizontal flow SU constant velocity carburetors; front and back - 3 cylinders each carb. The carburetors must be balanced for equal air flow to each bank of cylinders using an air flow meter. I was happy when this $600 "junker" easily passed its last mandatory smog inspection in December, 1998. This red '72 240Z starts easy, has firm brakes and a light touch on the accelerator pedal and steering wheel. It is a pleasure to drive even though the original push button radio fades in and out a lot. 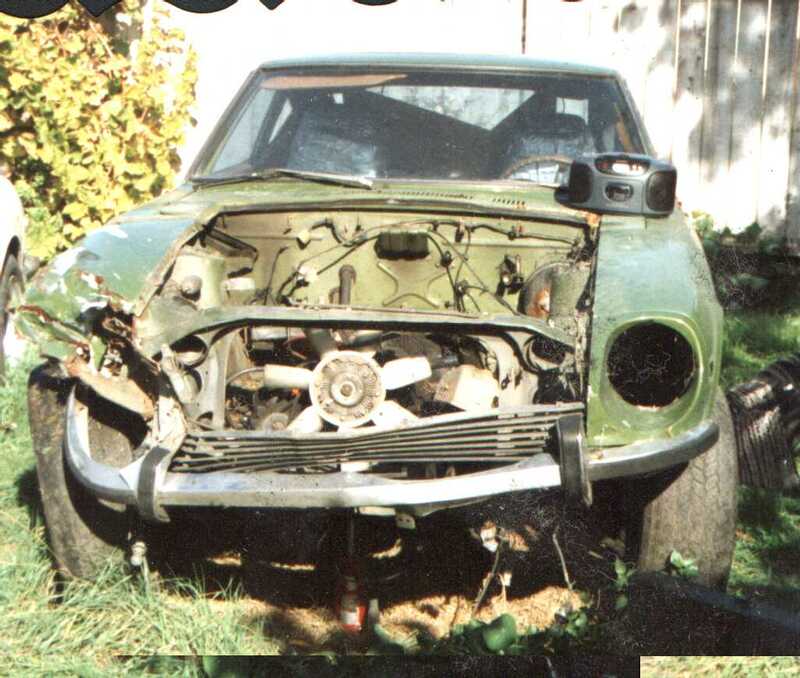 Below is my first Datsun 240Z before and after it was wrecked. 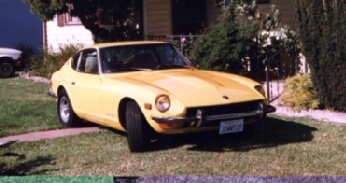 It had a 5-speed from a 1978 280Z and I once had it to 128 mph in Montana at 5,000 feet altitude. Now, parts from it enhance performance and decorate all my other Zs. 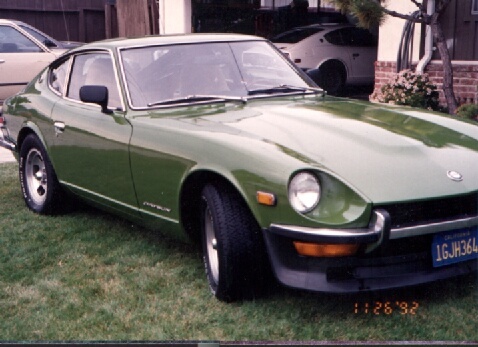 RIP green Z!